The Boerne, TX police officer who was arrested on charges of felony animal cruelty after shooting his neighbor’s cat with a crossbow while off duty on May 21 has been fired. Former Officer Lance DeLeon was fired by Boerne Police Chief Jim Kohler on Wednesday, two days after a Kendall County grand jury decided not to indict him on the felony animal cruelty charges on which he’d been arrested. The grand jury heard testimony from DeLeon and from Bobby the cat’s owner. Following the grand jury’s decision not to pursue charges on Monday, the Boerne Police Department said they’d completed an internal investigation to review if DeLeon violated policy. An Advisory Review Board recommended termination. “I have reviewed all of the administrative policy violations as it pertains to this case and felt that termination of Officer DeLeon was justified, effective today,” said Chief Kohler. DeLeon is expected to file an appeal on his termination. 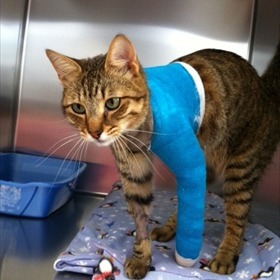 Staff at South Texas Veterinary Specialists said the 2-year-old male cat was been treated for a punctured lung and broken front right leg. Bobby is expected to make a full recovery from his injuries. Good for the Police Department; justice for the cat. Shame on the jury. You call this JUSTICE??? He SHOULD be in PRISON! I wouldn’t call it justice, considering the charges were dropped, but I’m glad to see the police cut him loose. FYI, he has been hired by Kendall County Sheriff’s Dept. The very county Boerne (the police dept he was fired from) is in. Very angry with this news! Email the sheriff Al Auxier @ [email protected] with your feelings. Let’s get this guy out of law enforcement! They say that anyone that abuses an animal is a sociopath. I wish I had him here I would turn him loose, he is such BAD example for Police Officers every where, send him here, I want to turn him loose, and do the same thing he did to Bobby, but GOD has him too! Burn in Hell ! Bobby I pray God will place his hands on u and heal! AMEN! That fat Slob should be convicted, cause when people see him on the street, he is a goner! People who are mean to animals can’t be trusted to do the right thing! Be it animals or people. I normally detest that old disrespectful slang name for cops but this guy does indeed look like a pig. Too bad he’s not in jail where he can be treated like Ned Beatty. The jury must have been made up of idiots. If this had been a normal joe bloggs, i am sure he would be in jail now. Just because he was an officer of the law he was treated differently, everybody should be treated the same way if you abuse animals you should pay. Don’t commit the crime if you don’t want to pay the price of said crime, if he does try to get his job back & gets it back the poor cat has no justice & it just says well i am a cop i can pretty much do anything i want. Just a shame they don’t put a tattoo on all animal abusers head so everybody can see who they are………. WRECKLESS jury decision not to indict this PSYCHOPATH & equally APPALLING if this police department reinstates his job on appeal! The irresponsible jury members should be paying this poor cat’s vet bills in appreciation for getting this deranged savage off of their community streets as a police officer who is supposed to be serving & protecting, not maiming and killing innocent family pets! And now he’s a sergeant at Texas Parks and Wildlife (Inks Lake SP). Smh. How can an agency whose focus is on animals hire this man?? ?